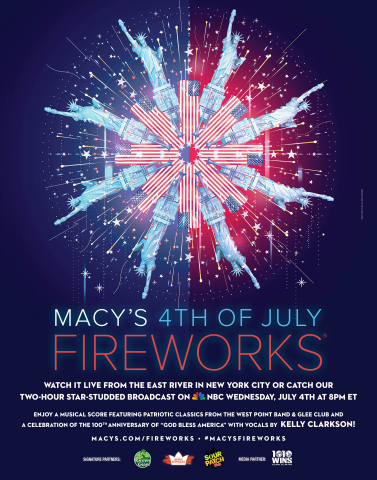 NEW YORK--(BUSINESS WIRE)--The nation’s largest 4th of July celebration will once again ignite the night with an unparalleled barrage of dazzling effects framing the iconic New York City skyline during the 42nd Annual Macy’s 4th of July Fireworks®. On Wednesday, July 4, more than 3 million live spectators along the shores of Manhattan, Queens and Brooklyn in New York City, and more than 12 million television viewers nationwide will be amazed by a jaw-dropping display of color, shape, light and sound, celebrating Independence Day. At approximately 9:25 p.m., the first of more than 75,000 shells and effects will hit the night sky and rumble towards Macy’s (NYSE:M) famed pyrotechnic finale, marking the spectacle’s largest display since the Millennial Celebration in 2000. Since 1976, Macy’s Fireworks have grown to become the nation’s largest Independence Day celebration in design, artistry, live and nationwide television audience. 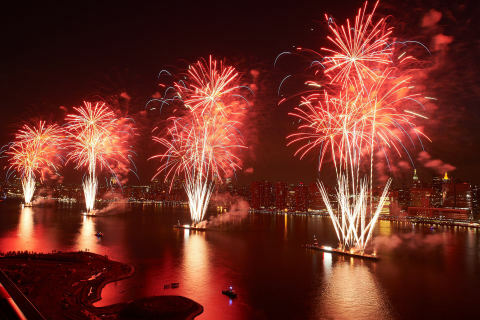 This year’s 25-minute spectacle will be 25 percent larger than last year’s presentation, with more than 3,000 shells and effects per minute launched from seven barges positioned between 23rd and 42nd Streets in midtown on the East River. The 42nd edition of the pyrotechnic splendor is designed with Pyro Spectaculars by Souza. Perfectly orchestrated to synchronize to the musical score, the display will feature a host of new shells in 25 colors and effects including neon pinwheels, swirling water fountains, brocade horse tails, ghosting fans, blooming ring chases, and pulsing hearts. In addition, to honor the 100th anniversary of God Bless America by Irving Berlin, a soaring new recording of the classic, sung by superstar Kelly Clarkson. will inspire patriotism in the hearts of millions. Backed by the full West Point Band Orchestra and Glee Club, the awe-inspiring tribute by Ms. Clarkson will be the show’s emotional and pyrotechnic centerpiece serving as the backdrop for Macy’s famed Golden Mile. This signature of Macy’s Fireworks ignites the skyline with a dazzling array of golden-hued effects for a mile across the river and from 1,000 feet in the air to the water’s edge. This year, in salute to the nation’s Armed Forces, Macy’s and its customers nationwide will come together for a charitable giving campaign to support and empower veterans and military families. The give-back campaign, “Macy’s Salutes Those Who Serve” kicks off on Thursday, June 28 and runs through Sunday, July 8, and will generate funds for select charities through donations in-store and online at macys.com. With a $3 donation, customers will receive, as a thank you, a 25 percent off* coupon that can be used on select merchandise (*see sales associates for a list of exclusions, discount is 15 percent off in some departments). One hundred percent of the donations will benefit three veterans and military family focused organizations: Blue Star Families, Bunker Labs, and Team Rubicon. These charities focus on a number of programs that support current and former members of the U.S. Armed Forces and their families, providing access to career development, caregiver support, entrepreneurship and business opportunities, as well as skills-based volunteering and community rebuilding activities, among other services. On Independence Day, spectators are encouraged to experience the full design of the spectacle by tuning in to radio station 1010 WINS to hear the musical score to which the entire show is choreographed. Macy’s 4th of July Fireworks can be seen from any unobstructed view of the sky above the East River where the barges are located. Public viewing locations and dedicated entry points will be set up along various streets on the F.D.R. Drive, as well as various points in Manhattan, Brooklyn and Queens. Check macys.com/fireworks for the most up-to-date information including exact points of entry, viewing locations for persons with disabilities and for marine viewing details. Spectators lining the shores of the East River will also enjoy an NYPD helicopter flyover and an FDNY waterboat show prior to the start of the display. Macy’s 4th of July Fireworks are made possible in part by signature partners Green Giant®, King’s Hawaiian®, and SOUR PATCH KIDS® Candy and are presented in partnership with the City of New York. Independence Day spectators from coast-to-coast can catch all the action in the sky by tuning to NBC’s two-hour live national broadcast of “Macy’s 4th of July Fireworks Spectacular” beginning at 8 p.m. ET/PT and 7 p.m. CT, with a one-hour encore presentation at 10 p.m. ET/PT, and 9 p.m. CT (check local listings). In addition to the pyrotechnic splendor, the 4th of July’s most popular entertainment special will feature musical performances from the nation’s premiere artists. For more information on the 42nd Annual Macy’s 4th of July Fireworks, please visit www.macys.com/fireworks or call the Macy’s Fireworks Hotline at (212) 494-4495, follow and participate in the excitement on various social platforms via @macys and #MacysFireworks.